Barcelona team come into this clash in high spirits after they dismantled bitter rivals Real Madrid 4-0 at Bernabeu last Saturday to go six points clear at the top of the La Liga table. It was a fourth straight victory in all competitions for the Catalans, who have scored 12 goals without conceding during that run. The Blaugrana can seal progress to the round of 16 with a draw as they are five points clear at the top of Group E.
Enrique will surely be tempted to stick with the side that won so convincingly on the weekend and Lionel Messi could be benced once again. Javier Mascherano will also miss out after suffering a thigh injury and Rafinha is also definitely out.Roma's Serie A title hopes suffered a setback as they recorded a 2-2 draw at Bologna at the weekend. The Giallorossi desperately need a positive outcome at the Camp Nou as they sit third in the standings with just a single point separating the Serie A side from Leverkusen in Group E. Garcia's men have conceded six goals to Leverkusen in two games, and 3 goals to BATE Borisov away from home. How can they stop Barcelona? De Rossi is a doubt with a thigh problem and could be replaced by Seydou Keita. Florenzi and Iturbe could start in attack, where Edin Dzeko will play as central striker, as the likes Francesco Totti, Gervinho and Mohamed Salah are all sidelined. 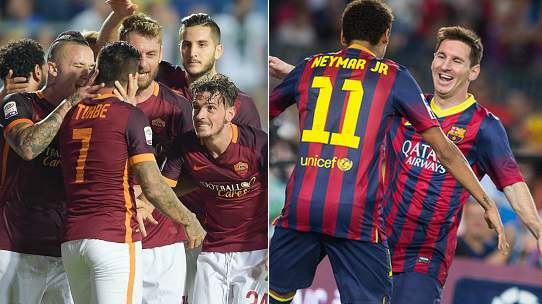 AS Roma held Barcelona to a 1-1 draw on matchday one, a match that saw Alessandro Florenzi scoring stunning equaliser. Barcelona have scored at least 2 goals in 8 of their last 9 matches in the Champions League.